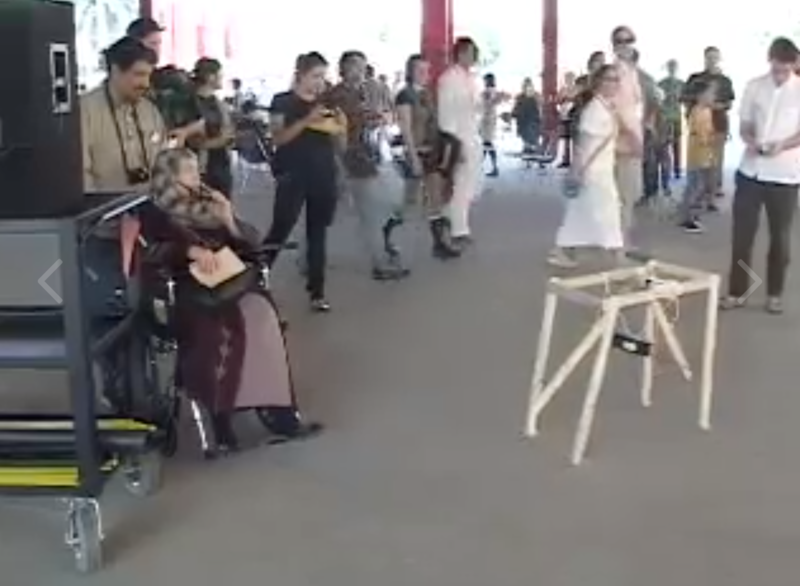 In the fall of 2012 Jean Byrne from the Penn Museum of Archaeology and Anthropology invited me to do a foals performance as part of the Philly Fringe Festival. We decided to do a workshop and performance called Monsters: A Workshop and Happening in the giant Chinese Rotunda. The workshop was similar to the one we did at MoMA, but we did a bit more pre-fab work (with some great Philly volunteers!) so that the foals were easier to put together. The crowd grew quiet as the foals neared the staircase. It seemed that people hadn't quite realized what was about to happen. As the first foal went over the stairs the crowd let out a gasp and some kids started crying. Their poor foals! More foals went over the edge and it turned into a ghastly pileup of pathetic creatures. Suddenly we started shouting "Set free the foals!" and everyone rushed to the stairs and started rescuing their foals. We then headed out to the garden where foal frolicking commenced. All foals survived the ordeal intact. Thanks to Jean Byrne and everyone at the Penn Museum and all of our volunteers and participants! 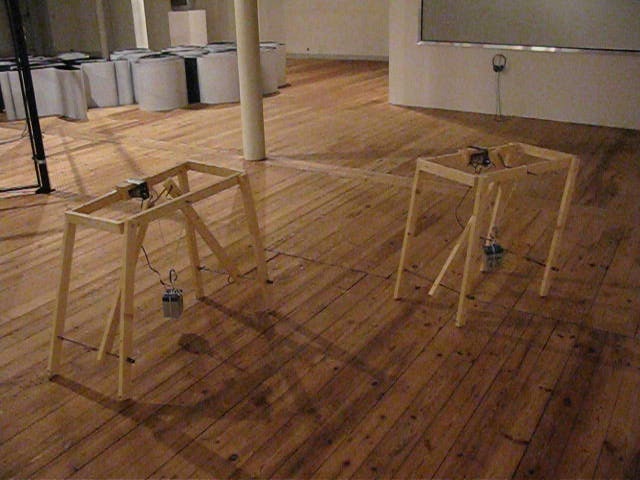 In the fall of 2009 I collaborated with Machine Project to do a foal building workshop and performance as part of the "Bauhaus 1919-1933: Workshops for Modernity" exhibit at the MoMA. We asked poet Joshua Beckman to write a traditional ceremonial foal poem to launch the foals out into the world, and invited Wet Ink Ensemble to put together an improvised musical score to accompany them on their journey. The foal design for the MoMA event was the simplest yet -- just a few pieces of scrap wood (donated by the MoMA woodshop), aluminum motor mount and shaft collar, steel crank shaft and leg drivers, a few bolts and screws, a 12v battery, some string, and plastic feet made from soda bottles. Workshop attendees cut the wood to size and drilled the holes, then assembled foals from pre-fabbed kits of the other materials. About fifteen people made thirty three foals in just four hours. After the performance the foals were offered for adoption, and they all found loving new homes in just a few minutes. Super thanks to Arturo Vidich, who was a superhero helper on the fabrication and organization of the workshop. Thanks also to all of the workshop participants and volunteers, and to Wet Ink Ensemble and Joshua Beckman for their wonderful contributions! Joshua was sick with the swine flu the evening of the performance, so his mysterious friend Anthony read in his stead. Thanks, Anthony! 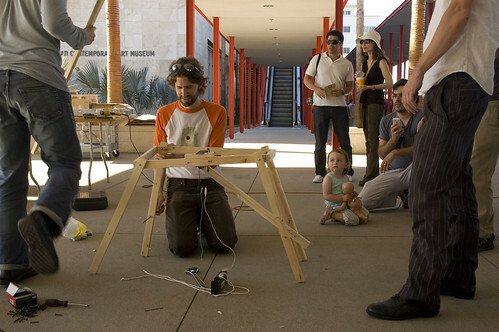 In the fall of 2008 Machine Project invited me and the foal to be a part of "A Machine Project Field Guide to the LA County Museum of Art". We said, "TOTALLY!" America's premier foal army gallops triumphantly* across the BP Grand Entrance, celebrating 101 years as "America's Favorite Fighting Foals". 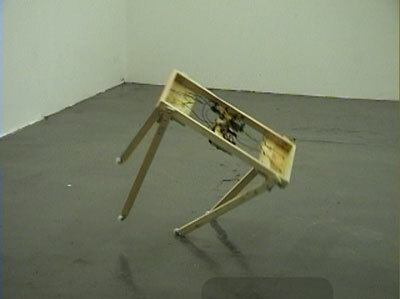 *due to recent budget cuts, miniature, underpowered foals may teeter, limp and/or struggle. Triumph optional. We spent the day at LACMA building simplified (using only one motor and a crankshaft, instead of the four motors in the original) foals with lots of nice visitors. We had a basic foal plan, and everyone was invited to start with that plan (or not) and build away! In the end we made six working/walking foals. A small, but potent, army. 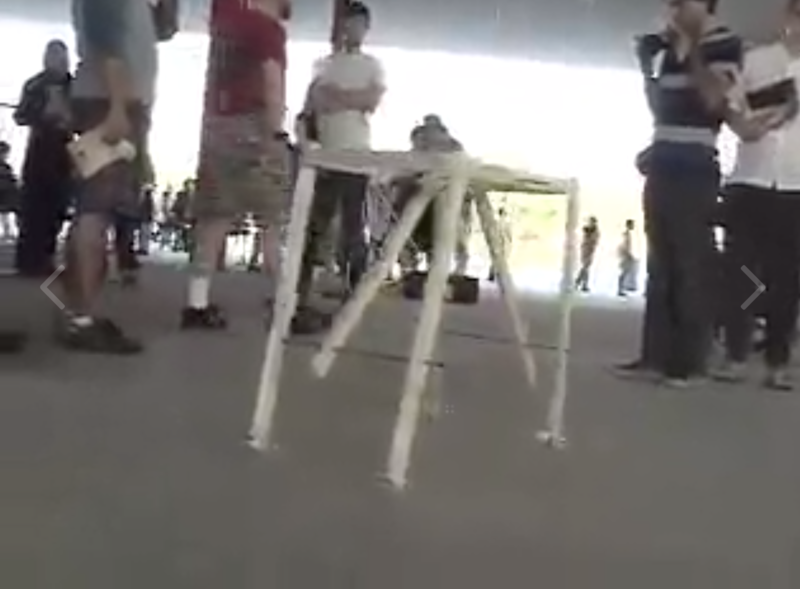 In the spring of 2007 Make Magazine invited me to bring the foal to their Maker Faire in San Mateo. My friends/wackos from Machine Project were there as well, and they were kind enough to share their space with me and the foal. Since the foal was already built and could happily wander around the expo hall on its own (sort of), I thought it'd be fun to spend some time building a little friend for the foal with help from Maker Faire attendees. So I spent most of my time at the faire sitting at a table building a flying birdhouse with parts that people brought to me. I had a piece of paper on the table with a list of materials that I was hoping to use. People brought me those and other neat things as well, and by the end of the faire we had a nice friend for the foal! 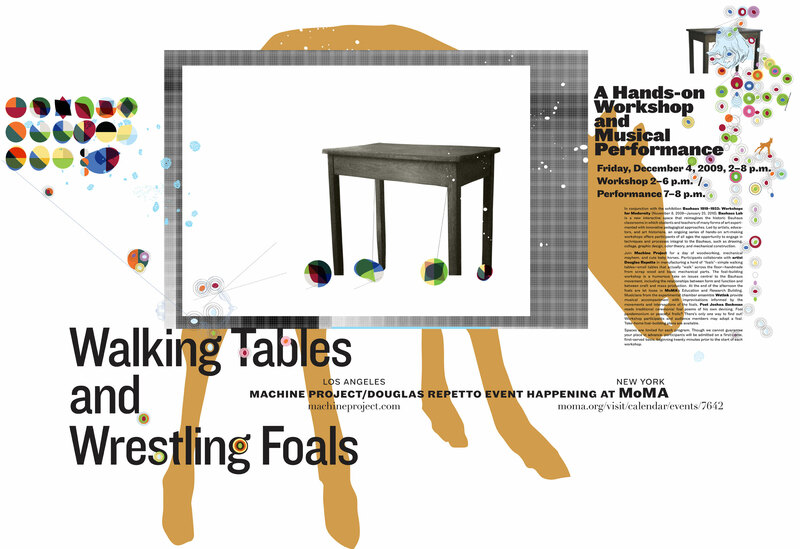 When the organizers of Festival Rümlingen 2005 asked me to bring the horse table to Switzerland, I decided instead to build a new version of the table, this time in the form of an awkward foal. The foal knows even less about the world than its parent, and spends most of its time blindly moving its legs every which way in a largely futile effort to explore the world. It's not easy being a walking table, but the little foal is doing its best!